The student demographics in many Catholic elementary and high schools are changing. When will school faculties begin to reflect those changes? Dale McDonald, P.B.V.M., director of public policy at the National Catholic Educational Association, identifies several structural barriers to a more diverse teaching staff at Catholic schools, chief among them a weak professional pipeline. Non-Hispanic white teachers still make up almost 90 percent of the faculty at Catholic elementary and high schools. Diversity is not a challenge only for Catholic schools. “There’s 3.6 million teachers in public schools and 150,000 in Catholic schools,” said Sister McDonald. The Pew Research Center, using federal data, reported in August that only 9 percent of teachers in public elementary and secondary schools are Hispanic, compared with 26 percent of enrolled students. (Overall, 20 percent of teachers are nonwhite or Hispanic, compared with 51 percent of students.) In Catholic schools, the dominance of white teachers is only a little more evident. According to the N.C.E.A., 87 percent are white (which can include Hispanic teachers), and only about 8 percent are Hispanic. About 17 percent of students in Catholic schools nationwide are Hispanic. Mr. Ospino also highlighted the benefits of more diverse staffs. “The literature is abundant. Teacher diversity enhances participation, self-esteem, affirmation of particular values; it helps to reduce biases such as racism and discrimination, and it improves [student test] scores, among other benefits. Average teacher salaries at Catholic elementary and high schools are almost one-third lower than in public school systems. Dioceses “look for diversity,” she adds, but “they have not gone out on a major campaign.” As Latinos have come to make up a larger segment of the U.S. church, they have become the focus of diversity-centered outreach. The pay gap between public and Catholic systems is especially large at the elementary school level. But more can be done. Ms. Weitzel-O’Neill and Ms. Melley are optimistic about the future of Catholic education, describing initiatives geared toward young Latino students. “The rock of Catholicism is creating a community of trust and love and respect for one another,” said Ms. Weitzel-O’Neill. 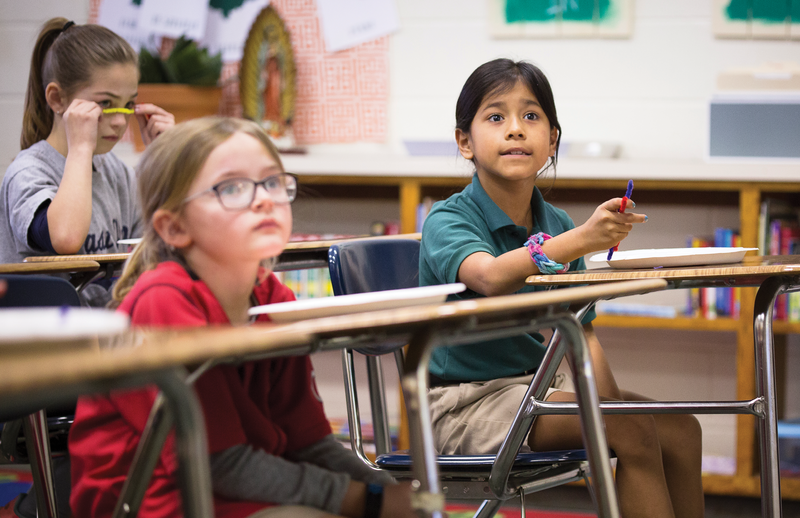 Two-way-immersion schools, in which students participate in a bilingual, bicultural curriculum from kindergarten onward, take to heart those ideals. This model serves students who have previously been marginalized, said Ms. Weitzel-O’Neill and Ms. Melley, while immersing students of all ethnicities in two languages. “Children taught to speak in more than one language outperform students in monolingual education systems,” Ms. Weitzel-O’Neill said. While achieving staff diversity can be a struggle for some Catholic schools, others are succeeding. Msgr. Aidan Carroll, president of Bishop Amat High School in Los Angeles, said his school’s faculty is as diverse as its student enrollment, which he estimated to be more than 70 percent Latino. He points to the 20 teachers who are themselves graduates of Bishop Amat as part of the explanation. What’s behind the Latino priest shortage? A variety of students are lumped together under the “Latino” label at Bishop Amat, he said, from those who speak Spanish at home to second- and third-generation immigrants who are learning Spanish as a second language and those who have one Hispanic parent and one non-Hispanic parent. Infographic sources: “United States Catholic Elementary and Secondary Schools 2017-2018,” National Catholic Educational Association; “A Look at Teacher Pay Across the United States in 2017” and Occupational Outlook Handbook, U.S. Bureau of Labor Statistics; “The Annual Financial Report: Catholic Elementary and Secondary Schools in the United States: 2016-2017,” prepared for the N.C.E.A. by the Center for Applied Research in the Apostolate. Salaries for public school systems do not include special education teachers, who have higher salaries. Salaries for public elementary schools are for grades K-6; salaries for Catholic elementary schools are for grades K-8. Hispanics can be members of any race and are counted separately from racial groups. J.D. Long-García, senior editor, also reported on this story. Twitter: @Jdlonggarcia. I would also like to add that such changes in Catholic schools will have a positive impact on the attitude of modern youth towards schools and a significant increase in the number of students. It seems to me that an increase in the percentage of non-white teachers in Catholic schools is a very successful idea. I am a teacher and a writer from https://senperfect.com/ and therefore I can assert that it is much easier for children to open to teachers of their race. It will also really reduce the level of racism. Accordingly, most non-white children will feel the support of the state and significantly increase the sense of security. This article also appeared in print, under the headline "Catholic schools challenged by changing demographics," in the October 1, 2018 issue.